Set in a magnificent 17th Century building in the very heart of the Marais in the Rue Vieille du Temple this two story duplex apartment was originally a 'hotel particular' (mansion house) built in 1622. The property is available for 1 month rentals, using a "Bail Mobilite" lease. Contact us for more details. The term Hotel Particulier refers to grand old private mansions built around a courtyard. From Rue Vieille du Temple walk through the incredibly high wooden carved doors and enter the green oasis of the central courtyard to reach one of the building wings. From here take the elevator leading to our 17th Century Maison apartment, one of only two duplexes built on the last two floors. Facing both the beautiful interior courtyard and the street, this bright, quiet and spacious 90 square metres or 970 square foot home sleeps up to four people. With wonderful roof top views of the old houses of the Marais you can see the magnificent stone and slate roofs as well as the street scenes of the Rue Vieille du Temple. The architect who designed the interior space created a mix of old venerable home with great vistas. The large living and dining room have stone tiled floors and arched ceilings with bold architectural steps leading to the upstairs bedrooms. Keeping the original wooden beams, white stucco walls and stone fireplace he created a truly romantic hideaway. The kitchen is practical and has all modern appliances such as washing machine, dishwasher and oven. The bathroom has a bath with wall-shower, water closet and a window giving you lots of light. Look through any of the nine panoramic windows and gain a fascinating insight into the days of glory of the old kingdom. The apartment is bathed in light in all rooms throughout the year and cool breezes in the spring, summer and fall. Close to Two Metro Stations, Hotel De Ville on Lines 1 and 11 and St Paul also Line 1. You are within a few minutes' walk to Ile De La Cite with Notre Dame and Ile St Louis where you can cross the river over the Pont Marie and meander through the Latin quarter and St Germain Des Pres (ten-minute walk). You can reach the Louvre in a few minutes as well as the Champs Elysees in 6 Minutes on the fastest metro line in Paris (line1). Going North visit the Museum of Modern Art at the Pompidou Centre (a 5-10 mn walk) or just wander along the famous streets of the Marais, the Delis on Rue Des Rosiers (the Famous jewish Quarter). The Flamboyant Gothic hotel Herouet Rue Des Francs Bourgeois, the Cloisters (at No 22) of the Rue Des Archives, the Musée Carnavalet (City Museum of Paris) on the Rue De Sevigne or 5 minutes' walk, the Picasso Museum, and 10 Minutes Away, the Place Des Vosges with the Magnificent Central Square and 17Th Century architecture. The street owes its name to the knights of the round temple (the Templiers) who first gathered there. We have stayed at the apartment on numerous occasions and we have also referred friends. We are all in agreement that this is a very comfortable home not only for 2 people but for a family as well. We look forward to staying again on our future visits. The location could not be better. Directly in the heart of the Marais district, very close to the Metro and bus lines. It’s also walking distance to the Louvre and Champ Elysees. We so enjoyed our stay in the Le Marais area of Paris in this beautiful apartment! The apartment was exactly as it was presented in the photos & description, & was just lovely! The location to everything is so convenient, & this is a perfect area to stay in while you're in Paris! We would, without hesitation, recommend this property & this company & plan to use them for future trips! What a wonderful location , it would be very easy to simply stay on this street and those nearby for the entire holiday! Great apartment with everything you would need for a city centre stay. The communication with Cherline, the agent for the apartment was clear flexible and quick. The apartment had everything we needed and was warm. The rooms are small as you would expect from a 17th century flat. The area was fantastic. A vibrant part of town very central, 12 minutes walk to the Arch de Triumph and about 1/2 an hour to the Louvre. The bus stop was about 7 minutes away easy walking. The street of the apartment is full of restaurants, cafes, shops and felt safe at all hours of the day and night. We particularly enjoyed Les Philosophers, a restaurant on the corner two minutes walk. Fresh, mainly organic delicious food, great staff that were happy to tolerate our lack of French with good humour and friendliness. The greeters were patient in explaining everything about the apartment. The apartment was spacious. The kitchen was well stocked with dishes, pots etc. The apartment is in a wonderful vibrant area. One small problem. There are several very popular bars downstairs. Until I found earplugs I was awake until 2 or 3 in the morning. Despite that small glitch I liked the apartment very very much. I would rent it again. My guests and I love to walk around Paris. This place seems to be very centrally located. We found it easy to walk to Bastille, the Louvre, all over. The elevator was a blessing after a long day exploring. We had an amazing stay in Michele's 17th century Maison! The location is perfect with an epic boulangerie, creperie and ice cream shop right at the bottom of the building! The literal heart of the Marais is where we found ourselves with a park just a block away, amazing restaurants and countless shops within a stone's throw. The apartment is beautiful and lived really well for our family of 5 plus granpere. The upstairs loft is something out of a storybook and the main floor lives perfectly if you want to bring back food and cook or just settle in for a book in the living room. The manager showed up immediately upon our arrival and was incredibly kind and helpful! We cannot wait to go back and plan to stay with Michele again! It was amazing! The apartment was great, and so was location. The place is decorated with good taste, not with the usual mass-market furniture and posters on the wall. We had an excellent stay. This apartment was fantastic! Our family of 5 stayed for a little over a week and it was perfect for us. We were met at the apartment by the rental agent who gave us a tour and a quick run-down on how everything worked. We felt good knowing that if anything went wrong during our stay we knew exactly how to get in touch with him. There was also a great little booklet that gave more in-depth instructions as well as recommendations for local places to visit and eat at. The apartment itself was just like it looks in the pictures - it gives you a great, old-time Parisian feel. It was more spacious that I expected. The building felt very safe. Everything was clean and in working order. We were provided with plenty of towels & linens, as well as dishwasher and laundry soap. The location turned out to be perfect - the La Marais neighborhood is super walkable - there's a great bakery 2 doors down, a gelato shop across the street, plus tons of other restaurants and shopping close by. The Metro is a quick 5 min walk away and from there all of Paris is accessible. The street can get a little noisy in the early morning and late at night (especially on the weekend) but otherwise, no complaints! "Great Loft in the Marais"
A delightful 2 story loft at the top of an old building. The surrounding neighborhood has many shops and cafes, perfect for a relaxing stay in Paris. The agents were great, met us and took us through this well-equipped apartment. Everything worked and we were extremely comfortable. This is the ideal apartment for an extended family or a small group of friends - unless you have wheelchair-bound members. As the bedrooms are up a step spiral stair, they are for the fleet of foot. Our second visit to this awesome home. We will definitely be returning again and again. Check in process was extremely easy. 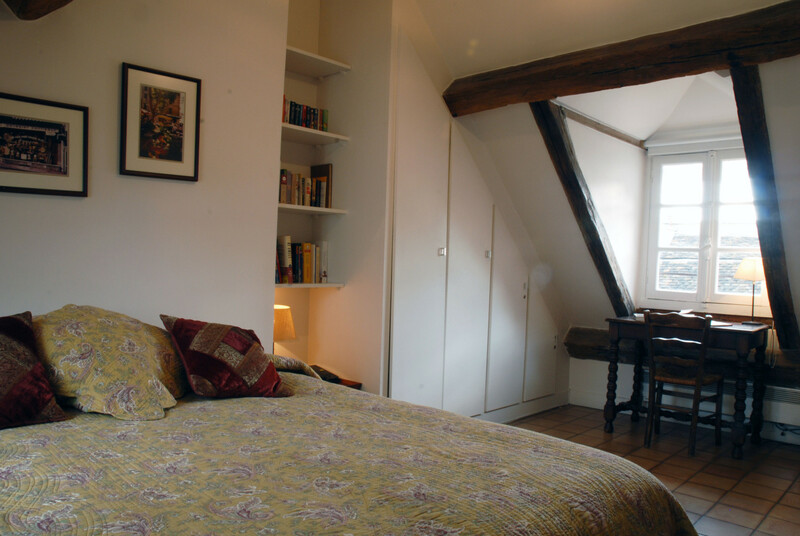 Walking distance to lots of sightseeing attractions. Great for family vacations. They may consider replacing the couches in the future for further comfort. Love, love, love this rental. "LOVED our vacation apartment in the Marais"
We were three adults and one child (husband, wife, son, and wife's sister). The layout was perfect for having lots of extra space so we weren't crammed in with each other 24/7. The master bedroom was great for my husband and I, while the second bedroom with two beds was great for my son and his aunt. The shower was the best I have ever experienced in Europe - great water pressure and not super small. The check in process was very easy and our 'host' was very pleasant and informative. The apartment has lots of windows for light and air flow. The windows open onto both the street and the courtyard. I loved laying in bed in the morning and watching the sun rise over the rooftops from my attic bedroom. The street was a busy one with lots of the necessities near by (fran prix, boulonger, etc). The metro was an easy walk as well. We would definitely rent this apartment again. We felt like it had everything we needed (washer/dryer, drying rack, iron, fans when it got too warm, big fridge, full over/range, microwave, dishwasher, extra towels and bedding, etc.). Thanks for the wonderful stay. "Beautiful apartment in the Marais (with an elevator!)" We just spent 8 fabulous days at the apartment in the heart of the Marais. The accommodations were excellent, quiet and perfectly located. We will definitely be booking here again in the future. Management met us at the apartment to review all details and answered all questions. Extremely satisfied clients. The staff was very helpful and explained everything in sufficient detail. The apartment was clean and stocked with the basics. It was ideal for the family including 2 young kids. In the heart of the marais it was an excellent location ideal for a base camp throughout Paris!!! "Two couples and two young adults"
We loved the apartment. First, booking was easy and safe through pay pal. Our Paris agent was terrific in getting us settled in and oriented, with great ideas for our stay. The space was beautifully designed with plenty of room, much larger than we expected. The kitchen had everything we needed for cooking and the international phone capability was a plus. We loved being up on the top floor- no problem at all. We did the stairs often on the way down, but the lift up was welcome on days we walked alot! Some things to consider perhaps- the hot water is VERY hot. The mattress on the pull out very thin and noisy (Ikea bed? )- we had to add many quilts to make comfortable. A leak from the shower door worried us. Something to consider-our stay was over the World Cup and Bastille Day celebrations. La Marais is very lively and noisy! We loved it, but others may not. Small food markets are very close, worlds best falafel's on rue de Rosier- 50 steps away. Terrific boulangerie next door. Shopping in the Marais is great fun. July has "Soldes" -sales on everything! We wandered and shopped till we dropped. One thing we did that was wonderful was attend a String Ensemble and soloist concert at Eglise St. Paul-Saint Louis. Fantastic! We walked to Ile St. Louie in 5 minutes, Notre Dames in 8 minutes. Our Paris agent suggested we do a hop on hop off bus the first day to get oriented to Paris-which we did. After, we got very good with the metro and went everywhere with ease. Don't miss Rue Cler. And lastly- get a Paris Museum Pass. "10 days in Le Marais with family of 4"
Our family, 2 adults and 2 teenagers stayed here for 10 days during the winter holidays. This is a perfect place for our size and age family. Our children shared a room. It was easy to prepare some food, to take a break from sight seeing and to adapt to a teenage rhythm of sleeping and eating habits with a place to come back to that was conveniently located near restaurants, markets, metro lines, food shops and within walking distance of most things. Though an en suite washing machine is nice for longer stays we did our laundry around the corner at a laundromat for efficiency purposes. The area is very touristy and it was nice to slip into the courtyard and up to the apartment when we had had enough. Additionally, the area is open similar to any metropolitan American city. I had some concerns about the holidays and Sundays which were unfounded. It is perhaps not completely 24/7 like our cities but our last minute food shopping on New Year's eve was not necessary though thoroughly enjoyable and resulting in a well cooked omelette on New Year's day. All told an Excellent 5 star place! Great spot for our family of 5 (mom/dad/6 year old/8 year old/grandma). Very bustling location - step outside the courtyard door and you are instantly right in the thick of things. Of course, with this, you do hear that same bustling street noise from the apartment (but it's people having fun. There are worse things to hear on a vacation). It really is in the heart of the Marais... great boulangerie a few doors down, great crepe place and falafel place are less than a one minute walk away. Plus easily walkable to two metro stops. The charming but tight staircase to the bedrooms and bathroom might be tough for very small kids or the elderly. Very professional transaction all around - the guy from the company met us there and walked us through everything. Security deposit was promptly refunded. Bonus - free phone calls to the US. Enjoy! "Charming, Comfortable, Plenty of Space, Great Location"
This apartment was perfect for us: two parents with two older children (ages 17 and 22). The two bedrooms and two levels gave us plenty of room. The apartment is clean, charming and looks just as pictured. It is five floors up and has a small elevator, but we used the elevator only at the beginning and end for our luggage. We climbed the narrow, winding stairs every day -- great exercise and old world ambiance. We cooked quite a bit, buying our daily delicious "baguette tradition" from the bakery two doors down. Several small grocery stores and produce markets within blocks. The kitchen had all utensils and pans we needed, plenty of soap and paper towels and basic amenities like olive oil, balsamic, salt, spices, sugar, etc. We used the dishwasher and clothes washer/dryer often. Bathroom is modern, and we had ample hot water for baths and showers and strong water pressure -- never a problem at all. The Marais neighborhood is LIVELY, which is why we chose this location. Sunday is packed with shoppers browsing the many boutiques -- classy shops, not touristy T-shirt vendors (go to the Latin Quarter for that vibe). The neighborhood cafes, brasseries, and clubs stay busy into the wee hours of the morning. Like other reviews have said, that means street noise that you can hear from the master bedroom (the second bedroom is quieter since it overlooks the private courtyard). But if you stay in a major urban city, you expect noise -- whether from nightlife or daily garbage pickup or construction. I brought earplugs and slept just fine; my husband stays up late anyway so it never bothered him. We walked and took the metro everywhere -- felt safe at all times and at all hours. On our last day we found the best breakfast place: Cafe St Regis on Ile St Louis. 11 euro for coffee/tea (best coffee I had the entire week, Mariage Freres tea), fresh squeezed juice, basket of toast and croissants, delicious jams with toast sticks, soft-cooked egg -- beautifully presented by a friendly singing waiter. Just walk straight down the street from the apartment toward the Seine, cross it, and cafe is on your left side just before you cross the Seine again to Ile de la Cite and Notre Dame. One other fun funky find is the art collective at 59 Rue de Rivoli. Several floors of striving artist studios that open to the public at 4 p.m. every day (except Monday). They also feature live music most days: http://www.59rivoli.org/main.htm. Enjoy! The apartment is situated in the middle of our favourite area, Le Marais. With cafes below, the best fallafel round the corner and being 10 mins walk from the Metro, this top floor apartment (with lift) is a great place to explore the area from. We thoroughly enjoyed our stay and would definitely stay there again. "San Francisco and Seattle Based Family Gives This Apartment Two Thumbs Up"
We rented two apartments for our family trip to Paris. Most of the group had never been to Paris. This apartment was the perfect introduction to the City of Light, as it is located in a great neighborhood with lots of amenities, and the Louvre is quite close. We absolutely loved the patisserie/boulangerie next door -- fantastique! (Not true a patisserie can't do bread, and a boulangerie can't do pastries, this place excelled at both.) The apartment is in a charming neighborhood. Delightful at every hour of day or night, always something to observe. Located on the top floors, the windows offered glimpses of Paris life you won't see from a hotel room. The living room was comfortable, the dining room warm and the table large enough for our entire brood. The dual pane windows kept out the cold and outside noise. The kitchen had all the modern conveniences and preparation of meals was much like home. Really appreciated having the washer/dryer. The heated towel rack in the bathroom was a plus, too, as it was a chilly spring when we were there. Beds were comfortable. We usually walked to the various sites, but the metro isn't far away, so the location is ideal. We would stay here again and recommend it highly. What a great location, in the heart of the bustling, energetic Marais with wonderful boulangerie, tea shop, charcuterie, bistrot plus fun shops/boutiques and lots of people watching all within the blocks surrounding the apartment. Easy easy (and fun) walk to the Seine and over to the west bank. Two metro stations nearby. Apartment itself worked just fine for us -- one couple, one older adult (elevator very reliable), one teen. We cooked in a number of nights and had everything we needed in the kitchen....plus a washer/dryer so we could pack lightly. Warm welcome from the realtor, quick response to a couple questions about the phone/internet, both of which worked just fine. Perfect location! Loved the place! Highly recommend! Will return. "Cool Stay in the Marais"
Our family had a wonderful week in the Marais on the Rue de Vielle du Temple. The house was well located, with a bakery next door, a gelateria across the street and plenty of bars and restaurants. We could have eaten every meal within five blocks of this house. The kitchen was small, but it had everything we needed. The bedrooms and bathrooms were well maintained. A fine place - we would recommend it for families or for adventurers seeking a "cool" side of Paris. The apartment was the best location we could've imagined. The coffee shop and patisserie downstairs, wine bar across the street, cafes around the corner, best Crepes, falafels and pita Mediterranean foods around the other corner ... I've even to Paris many time, and this location was by far the one I will come back to. The agent met us the the apartment and spent a lot of time with us. We are a family of five, and were very comfortable! We will come back to this apartment. We recently spent a week in this charming 17th century apartment and couldn't have been happier. The location is superb, blocks to the Seine and Isles of St. Louis and Cite. Is is on a busy and fun street in Le Marais, with a wonderful bakery downstairs and a couple of grocery stores within a few blocks. We cooked in most nights, after 2 earlier weeks of multicourse gourmet eating. The kitchen is well equiped for simple meals. The apartment is nicely supplied with necessities like paper towels, dish and laundry detergent, tp etc, often not adequately supplied in European rentals. The living areas are spacious and provide a new flat screened tv and good wifi coverage. The bedrooms also had good storage space and room for luggage, if you didn't want to unpack everything. Be sure to take advantage of the excellent free exhibits in the close by city hall (hotel de ville, a good bus stop/landmark as well). The Carnvalet museum is also very close, allowing us to visit it twice (also free). This apartment was exactly what we wanted. Somewhere central that would easily accommodate four adults at the end of our trip. The kitchen had everything we needed and the lounge room was comfortable for all. I would definitely stay there again. The apartment is spacious and charming. It's on the top floor with windows looking out over both the courtyard and the street - great cross breezes as well as roof top views. And there is an elevator. Our family of five adults was very comfortable. The kitchen is well stocked with a new stove, washer/dryer unit, refrigerator, coffee maker, microwave and toaster. There is easy access to restaurants and bakeries right out the door and two grocery stores within a five minute walk. The metro stop at Hotel De Ville is close by. It was an easy walk to Notre Dame. The location could not have been better. The agent was excellent and met us at the apartment to check us in. She gave us some great tips on getting around, what was nearby, where the market was, etc. She went over how the appliances worked and made sure we were all connected to the internet before she left. We also received our damage deposit back within the stated time frame. We loved our visit to Paris and will use Paris Rental Connections again. We were met at the apartment upon arrival by the manager who was very accomodating. She walked us through the entire apartment and provided detailed instructions on appliances and any nuances. She was also very easy to reach when we had difficulty with the dryer. The apartment was quite comfortable. My wife and I were joined by our 21 year-old daugher for four nights. There was enough room to host one of our other two children as well. Both bedrooms and the bathroom are up short flight of stairs from the living, dining and kitchen. The master bed was quite comfortable. While not a problem for me, the roof line does slope in one side of the bed making you duck your head a bit to get in and out of bed. I am 6 feet tall. The kitchen was sizable enough to allow for cooking small meals - we stayed in two of our nights for dinner. While I read about it in other reviews, the street noise was not a problem for us. The master bed is on the street side, but other than a Friday and Saturday night on Easter weekend, there was little to no street noise. The location is ideal to groceries, cafes and the many flavors of the Marais area. Just a short walk to to the River Seine. The apartment was the perfect retreat after a busy day of touring. We shopped like locals and used our apartment for relaxing and regrouping with wine, cheese, baquettes and other local flavors. I have recommended the apartment to friends and would definitely stay there again. The agent who met us did a fabulous job of providing information about the apartment, the neighborhood, and Paris in general. The apartment was perfect as we were two couples and were able to enjoy two separate rooms upstairs with a comfortable "wine and dine" spot downstairs. The kitchen was adequately stocked for cooking (which we did not do) and opening wine, serving pastries. The apartment has windows that open and keep the apartment cool and, if you listen to the agent's directions to close the shades in the morning, your evenings in the summer will be comfortable. There is a pastry shop one building over and location location location is everything. I cannot praise the agent enough as she went over and above her call for duty when I managed to arrive stateside without a few items and she engaged in due diligence searching the apartment. I would highly recommend this beautiful apartment which is complete with a courtyard on the main floor. We couldn't be more thrilled with our experience, not only with the amazingly beautiful apartment but with the professionalism we experienced with Paris Rental Connections. The rental experience was seamless and Shelley's warm welcome, along with a detailed description of every aspect of the apartment and great tips for appreciating the neighborhood made our time in Paris incredibly enjoyable. We did not want to leave and would highly recommend not only the agency but this particular apartment with our highest approval! We have rented many flats before and the duplex in the Marais was worth every euro- for a truly special birthday celebration. The location and the apartment were wonderful. We had a fabulous time and felt staying in the Marais area offered a true flavor of Paris. Narrow streets, wonderful cafe's, small markets, and some wonderful shopping opportunities. Also the metro is within two to three blocks with connections to anywhere in the city you want to go. The apartment itself was perfect for our family of 5. We had a lot of room and having two floors meant we had plenty of space. The pullout in the living room worked perfectly for our sleeping arrangements. We had a great week in Paris in this comfortable apartment in a really great location! Enjoyed our 10 day holiday in Paris. Very nice apartment. Charming. Fully stocked kitchen; many books including information about Paris. Not huge, but large enough for a family of 4 and BRs are upstairs which is good. Extremely well located on vibrant Marais street full of a mix of pattiserries, boutiques, bistos, brasseries and interesting stores. A block away from some of the best fallafel in the world. A short walk (30 mins or less) to many, many places. A little oasis that we looked forward to returning to after a busy day. My family & I had a wonderful stay in your delightful maison. It was well located to take lovely walks from and we enjoyed the extra touches such as the bottle of wine on arrival. I would thoroughly recommend anyone to stay here. It is more a home than a holiday apartment. We had a wonderful stay. The apartment felt like a home and we really appreciated the little extras such as the guidebooks and the pram that we could use. The apartment is in a wonderful location, you could feel like a local for a little while. We have just returned from a fabulous week with our 2 teenagers in the 17th Century Maison. The appartment was exactly as in the pictures, spacious comfortable, clean and full of charm and character. The area was wonderful and made an ideal base from which to explore Paris and was full of restaurants, little shops, and exciting streets to explore. All the arrangements worked perfectly and we would really recommend this appartment as a lovely place to stay and would certainly come again! This is a delightful property and is very well equipped with views over the courtyard. The Marais is great a area for restaraunts, bars and boutique shops whilst also being very centrally located for everything you would want to see. Michele also made everything very easy to organise. The 17th Century Maison provided a wonderful nest for our three week "residency" in Paris. The accomodation was even more spacious than we had expected. The apartment is comfortable, clean and spectacularly located for traditional Paris tourist attractions as well as just assimilating the Parisian life. Restaurants, boulangeries, bistos etc abound in this stimulating neighbourhood. Michele, Wila and the cleaning lady were delightful, available and responsive. The ability to have our family and grandchildren drop in comfortably for a few days made this a truly memorable experience. Spent a week in this lovely apartment. It's all you see, and so much more. Just a charming place, and a great location. Also, Michele and her local staff are wonderful people to deal with. Little problems were taken care of "illico presto." I'll happily stay here again. Hard to decide whether to recommend or keep this one to myself !! My children, husband, and I have just returned from a wonderful Christmas Week in Paris. This apartment could not have been in a better location!! The neighborhood and street it is located on are wonderful. Pictures just don't do it justice! Restaurants, bakeries, and shops were next door - I miss my morning croissants!! In the week we were there, we only rode the Metro 5 times, and several were due to the icy rain our last day. Otherwise, we were within walking distance of most of the major sites: Notre Dame, Louvre, Musee d'Orsay, Pantheon, and others. We enjoyed having a kitchen for fixing breakfast and a washer/ dryer for doing small loads of laundry. The arrangement of the 2 bedrooms was perfect for us. I agree that it would have been nice to have had a working fireplace - wood or gas -especially since it snowed while we were there. Michele was very helpful and extremely prompt in answering any questions. I highly recommend this apartment. I am very happy that I decided to have an apartment experience and living "in" Paris versus staying at a hotel and visiting Paris. My two weeks in the Marais at the 17th Century Mansion were terrific and I got a sense of what it is like to be a citizen of Paris. Michele the sales agent was ever-helpful and always accessible, and Tristan the caretaker was also helpful. The apartment is very well amended, (although I wish the fireplace were in working order as it is part of the charm I was looking forward to) and the location could not be better for a Marais experience. As my sister exclaimed, "Walking out of the courtyard through the huge wooden door was like walking into Oz." The apartment is quiet as is the courtyard, but when you open the front door into the street...it is hustling and bustling with energy and life. If you are looking to be in the center of Marais life, within 5 minute walk of Notre Dame, main subway stations, and great food...then this is a perfect choice.